At first I tried to compress images locally, but it took to long to run through all the images I had. So recently I started using a service called tiny png to compress images. Now the website seems to indicate that you upload images, and you will get back optimized versions. However to me this takes too much time. I don't want the hassle of zipping my images uploading them, downloading the results. Again, lazy! So I figured out they have a cli in npm. Easy to install, just use npm to globally install it. 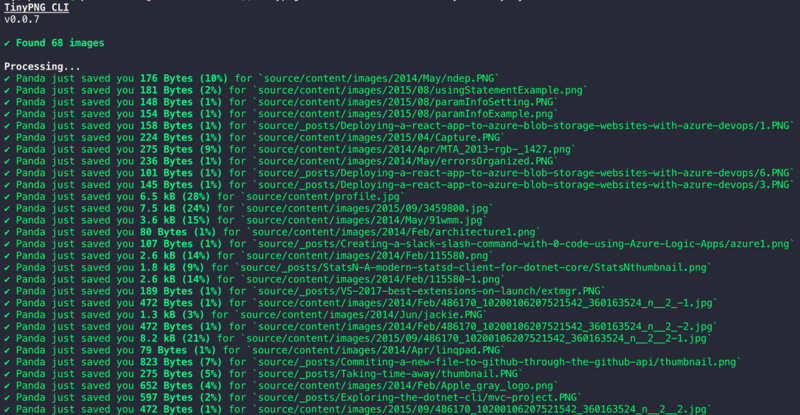 npm install -g tinypng-cli. Now you have to call the cli, this is the flags I use tinypng . -r -k YourKeyHere. The period tells tinypng to look in the current directory for images, -r tells it to look recursively, or essentially to look through child directories as well, and the -k YourKeyHere is the key you get by logging in. On the free plan you get 500 compressions a month. Hopefully you will fall into the pit of success like I did!